Zhuang Hong Yi is one of China’s most influential artists. Characterised by a daringly-bold colour palette, Hong Yi's sophisticated, repetitive and precise floral motifs reflect both his Chinese background and integrate a Western allure. Zhuang Hong Yi works in two dominant yet distinct mediums, creating what can be described as three-dimensional paintings. His Flowerbed series is produced through painstakingly folded origami rice-paper flowers covered in colour-shifting layers of acrylic and oil paint. Hong Yi also implements a more traditional painterly approach, applying acrylic in heavily sculpted and gestural impasto with unfolded rice-paper flowers. Hong Yi’s bright flower motifs link his cross-cultural environments. The artist moved to the Netherlands in the 1990s, where the the notorious tulip mania of the Dutch Golden Age in the 17th century epitomised his floral fascination. Conversely in China, flowers symbollically represent growth, fulfilment and prosperity, as well as manifesting good chi. Recurrent in Hong Yi’s work are the lucky chrysanthemum and lotus flowers, signifiers of metaphysical purity and strength. For Hong Yi's work the floral motifs reflect his environmental concerns, such as the rampant urbanisation in China and the ferocious plundering of natural resources and the depopulation of rural Chinese communities. Zhuang Hong Yi has a broad international following across Europe and Asia. His floral motifs are included in various private and museum collections including the Museum of Sichuan Fine Art in China and the Groninger and Stadsmuseum Zoetermeer in the Netherlands. 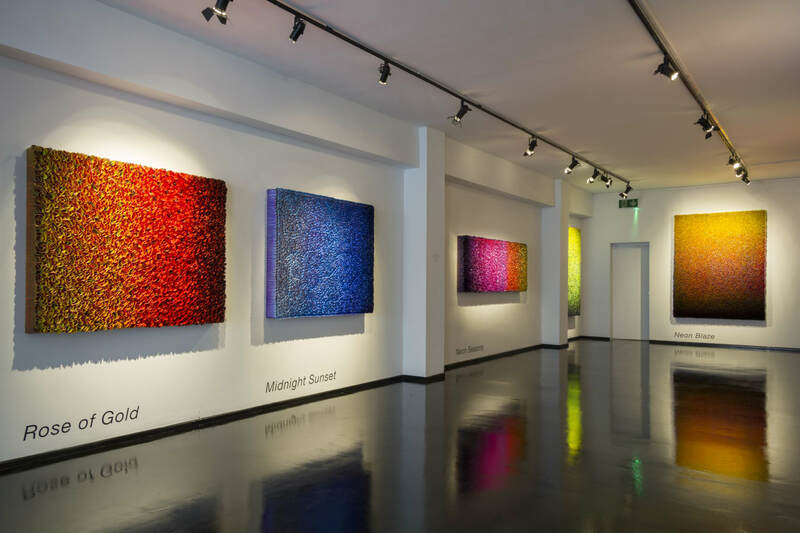 Zhuang Hong Yi returns to Unit London for a debut exhibition 24 April - 18th May 2019.